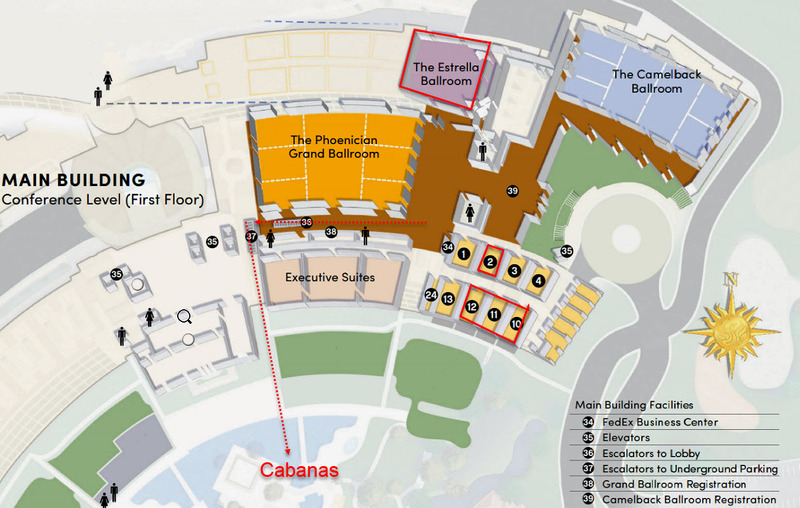 How do I get from the airport to The Phoenician? The Phoenician Resort has no shuttle, so you can drive, Uber\Lyft, or take a cab - it's about 20 minutes away. Overnight service is $33 per evening. Self-parking is offered at $18 per night. Wi-Fi is free in the conference area for attendees. Wi-Fi is also free in the resort for resort guests. It would help everyone if you set your Win10 updates to pause for the week. What if I want to stay extra nights at the resort—is there a deal? We want you to enjoy your stay at the resort! Your MMS DE registration includes Sun\Mon\Tue nights. Should you wish to extend your stay, days before and after that can be obtained by calling the resort directly to add on to your reservation (at your cost) or online using our special link. What if I want to stay elsewhere, can I still attend? Sorry, but we have a high room commitment for MMS DE which is why we have only one ticket type. Local attendees only: you can email us with proof of being local for a non-hotel code (limited number available). Due to our room night commitment, we cannot extend this code to others. Yes! Please contact The Phoenician for specific questions. How long is the walk from The Phoenician resort rooms to the conference center? From from private to casual dining, catering, and beyond, The Phoenician offers eight delicious dining options. Note that unlike the MOA event, we're planning outdoor lunches on Monday and Tuesday. Breakfast and dinner will still be on your own, with ample options available at the Phoenician. And talk to the sponsors - they might be putting on some dinners. What is included with the room? Of course! The Phoenician is very family friendly. However, only attendees with a badge will be permitted in the conference center. Unlike many other conferences, MMS will begin early on the first day, Monday Dec 3rd, but arrive on Sunday, Dec 2nd so you can make the welcome reception at 5pm. Check twitter (#MMSMOA) to find colleagues and connect the evening before the conference begins (you'll find many of us at the Thirsty Camel). Also, sessions will run until 8PM on Tuesday, Dec 4th. The airport is only 20 min from the resort. The MMS staff and sponsors will more-than-likely have some impromptu social gatherings on Tuesday, Dec 4th — spend an extra night and enjoy more geek-speak! Why should I attend this Desert Edition of MMS? If you are able to attended the full 4-Day event in May, do so! But if you just missed it, if it was sold out, if you have some personal or work conflict, or if you just like the idea of a warm resort in December, then this 2-Day Desert Edition is for you. This MMS still maintains many of the hallmarks that make MMS great: 2-speaker sessions, long Q&A, etc. We'll catch you up on what you might have missed from May and probably more importantly, we offer the opportunity to network with your peers — this is something that is nearly impossible at large conferences. Network with peers, share war stories, brain storm, and share best practices. Will there be new content at MMS DE or all a repeat from MMS MOA? Since our world changes every day, there will undoubtedly be fresh, new content at MMS DE. However, if you attend both MOA and DE, you will find some content repeated at DE (that we wouldn't repeat at the next MOA). The Midwest Management Summit was created to help foster the community that is lost in larger conferences. We want you to get to know people, share ideas, and not get lost in the crowd. No wallflowers! We want you to have time to ask questions at the end of a session, as well as participate in several Nerds of a Feather sessions. At just 250 attendees (including speakers), this is the most intimate of conferences. Room size varies from 35 – 100 attendees, ensuring a community-feel for all. Like many technical answers, “it depends.” You can choose the package with resort and/or take advantage of the early bird special. Registration will include access to all sessions, vendor expo, and a limitless amount of conversations with your peers- this one is priceless. If this conference is relevant to what you do for a living, then there is no reason you can't pay for this out of pocket. Registration with resort, your meals, and your travel expenses can all be written off your taxes. Talk to your tax preparer or CPA for more information. Don't let that stop you from joining us! Is there HDMI on the room TVs in case I want to hook up my laptop?